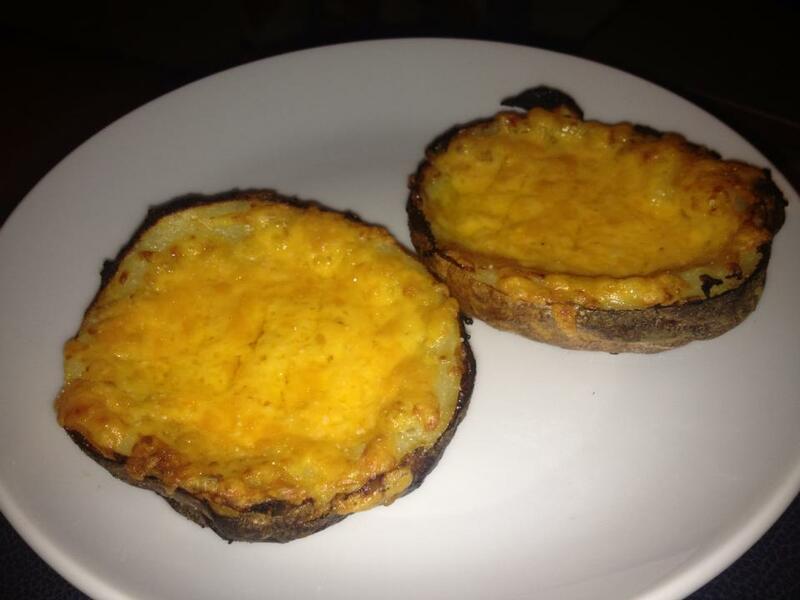 Loaded potato skins are one of my all time favourite starters to have whilst out at a diner/restaurant or at home before a main meal. I particularly love TGI Friday's and Planet Hollywood's skins. You can fill your skins with whatever you like. I'm a bit of a plain jane and prefer just cheese with mine but I often load them with cheese and bacon for others ... Cheese and onion is another popular preference. So how do I prefer to make mine? 2. Once your baked potato is cooked and soft in the middle, stick it in the oven for 10 minutes until it browns and the skin hardens. 3. Once you have a semi-looking burnt potato (LOL!) take it out and slice it in half so you are left with two shells (see photo above). 4. Thereafter, get a small spoon and draw a circle in the potato, leaving a thin potato border round the edges. Scoop the potato out, leaving the border. 5. You now want to get your butter and with a knife, glaze it over the potato and add a little salt. 6. Once that is done, take one cup of cheese and 1/2 your bacon and load it in to skin number 1 - I like to do a layer of cheese and a layer of bacon until the skin is pretty loaded - repeat for the other skin. 7. Sprinkle any remaining bacon you have over the top of each skin. 8. Put your skins under the grill and keep an eye on them - Do not let them go on fire like I did one time LOL!